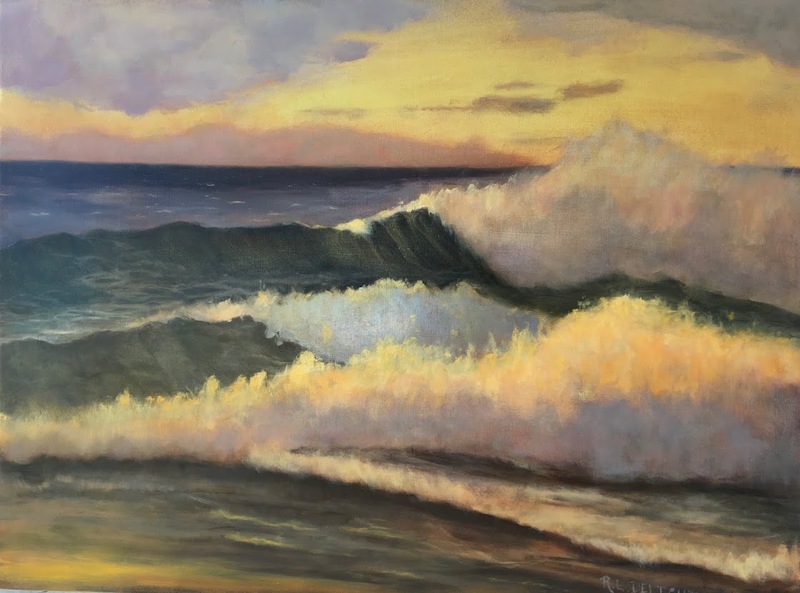 Before I get started, here is Wave Study #64, which not only has a title but is for sale on my Daily Paintworks page starting November 1, 2013. I am putting it and the next 54 or so paintings I make for the following project in a Daily Paintworks Auction. The title of this painting is Gray Break. Read on for the full story on the project! © 2013 R.L. 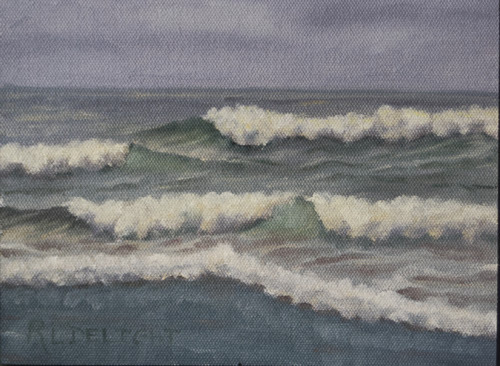 Delight, Wave Study #64: Gray Break, 6"x8", oil on canvas panel. This painting is now for sale! Please click Here if you would like to purchase. One of the activities I did during my recovery time was to write down my goals as an artist. I wrote the goals 10 years out. The first five years' goals were much more detailed than the last but I am glad I did this. I had the time to put some thought into it. This month will be my official one year anniversary of plein air painting. So far I have been learning mostly from just going out and painting. I have also studied books and videos. One of my goals this coming year is to attend a plein air workshop. I have only had one other workshop, from Robert Liberace, which was two years ago and definitely not plein air. It is time. I have a short list of two people I would like to take a workshop from. Donald Demers, and Kathleen Dunphy. I am still adding to the list but these two are at the top. Don Demers is mainly on the East Coast of the U.S. and for my next workshop, I decided to stay closer to home. Kathleen Dunphy is in California and lives near my husband's family. Kathleen Dunphy teaches around two workshops a year and they fill up fast. Of course, it was already too late for this year but I found a workshop in May 2014 and sent my deposit in. I am very excited! Her work is exquisite and more importantly, her painting and art philosophy appears to mesh with mine, with room to grow. I have actually been wanting to take a workshop from her for quite a while. She recently was interviewed on the Artists Helping Artists podcast which pretty much sealed my decision to sign up. It is one of the shorter workshops but this one is a prerequisite for her longer "No Whiners" workshop. The shorter one will also give me an idea if I want to invest in the longer one. I don't intend to take very many workshops so I am going to be choosy. Speaking of investments, that leads me to the "bootstrap kickstarterish" part of my post title. I will need to pay not only for the workshop but travel and lodging expenses. It is a financial investment well worth making. With that in mind I am going to paint my cute little rear end, um, dignified posterior off! This project will go from November 1, 2013 to May 1. 2014. I will be painting 2 small paintings a week to sell on my Daily Paintworks site with a starting bid of $75. The auction goes for one week with a re-list of three times. If the painting is not sold in that time it defaults to $125. All of the proceeds will go to pay for the workshop and the expenses of travel and hotel. There is also the added beauty that people will own a painting to enjoy. Wait! It gets better! As a small token of gratitude, every person who buys a painting will be entered into a drawing for a 12" x 16" painting that will be completed after the workshop and no later than July 31, 2014. I will be painting 54 paintings in all so that means a one in 54ish shot for a larger original piece of art. Well, I know that I am personally not in a position at this time in my life where I have a few extra dollars to buy a wonderful piece of art. If someone refers a lovely person to my site and they purchase a painting then both the art collector and the person who referred them with be entered into the drawing. Believe me, I would love to fill my walls with all the wonderful art I see. This gives someone a chance to be rewarded for doing a kind deed. This is the project and Gray Day is the first painting in the series. I will come up with a name for the project soon. Suggestions in the comments section or on my Facebook page are welcome! Details on the drawing of a winner at the end of the project will be coming in the next post. Whew! That is it for now. Time to go roll up the sleeves and paint!